The X-53 Active Aeroelastic Wing (AAW) development program is a completed American research project that was undertaken jointly by the Air Force Research Laboratory (AFRL), Boeing Phantom Works and NASA's Dryden Flight Research Center, where the technology was flight tested on a modified McDonnell Douglas F/A-18 Hornet. Active Aeroelastic Wing Technology is a technology that integrates wing aerodynamics, controls, and structure to harness and control wing aeroelastic twist at high speeds and dynamic pressures. By using multiple leading and trailing edge controls like "aerodynamic tabs", subtle amounts of aeroelastic twist can be controlled to provide large amounts of wing control power, while minimizing maneuver air loads at high wing strain conditions or aerodynamic drag at low wing strain conditions. The flight program which first proved the use of AAW technology in full scale was the X-53 Active Aeroelastic Wing program. Active Aeroelastic Wing (AAW) Technology is multidisciplinary in that it integrates air vehicle aerodynamics, active controls, and structural aeroelastic behavior to maximize air vehicle performance. The concept uses wing aeroelastic flexibility for a net benefit and enables the use of high aspect ratio, thin, swept wings that are aeroelastically deformed into shapes for optimum performance. 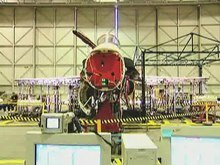 This makes it possible to achieve the multi-point aerodynamic performance required of future fighter, bomber, and transport aircraft. AAW Technology employs wing aeroelastic flexibility for a net benefit through use of multiple leading and trailing edge control surfaces activated by a digital flight control system. At higher dynamic pressures, AAW control surfaces are used as "tabs" which are deflected into the air stream to produce favorable wing twist instead of the reduced control generally associated with “aileron reversal” caused by trailing edge surfaces. The energy of the air stream is employed to twist the wing with less control surface motion; the wing itself creates the control forces. AAW's use of favorable wing twist response at high speeds, is viewed as a return to the wing-warping concept used by the Wright Brothers. Active aeroelastic wing technology enables a higher aspect ratio, more aerodynamically efficient wing which can be used to reduce induced drag at low wing strain conditions and, at higher strain conditions, reduce maneuver air loads. Overall benefits of AAW technology to future systems include substantially increased control power, reduced aerodynamic drag, reduced aircraft structural weight, and increased design latitude in terms of wing span, sweep, and thickness. The pre-production version of the F/A-18 was an ideal host aircraft for proving AAW technology, a relatively high wing aspect ratio for a fighter, with adequate strength, but no additional stiffness was added for static aeroelastic issues. The X-53 F/A-18 was modified to allow two leading edge control surfaces to work in concert with its two trailing edge surfaces to control wing aeroelastic twist and provide excellent high speed rolling performance. An aircraft maneuvers by deploying flight control surfaces into the airflow, which changes the air force on the surface. For instance, the ailerons on the wings used to roll an aircraft work by increasing or decreasing the lift of the outer portion of one wing, while doing the opposite on the other wing. This imbalance in lift forces causes the aircraft to rotate around its longitudinal axis. It is the latter effect that is considered to be detrimental. When the aileron is deployed, the airflow is deflected at a point well behind the center of lift. This creates a torque around the span axis of the wing, which "flattens" it in relation to the airflow and reduces the effectiveness of the aileron input. Although this effect is quite small at low speeds, at higher speeds the amount of airflow over the surface can be considerable, enough to cause the entire wing to flex, an effect known as aeroelasticity. Since the control force of the aileron is a function of speed, and an aircraft has to be maneuverable at landing and takeoff speeds, there is a lower limit to the size of the control surfaces that can be used. In some cases, like the Supermarine Spitfire and Mitsubishi Zero, this meant that at faster speeds the forces on the controls were extremely high. In the case of the Spitfire, these forces acted on a very thin wing that was highly elastic, and in dives the wing would twist so much that the lift curve was opposed to the motion of the aileron, reversing the direction of the roll. This problem required several rounds of upgrades to correct. The same problems affect modern aircraft as well, but today's wings are engineered with greater stiffness, to reduce the problem. Once the plane is built and flown, the flight control software is then adjusted to correct for the loss of control due to aeroelasticity. However, this simply hides the problem; the aeroelasticity still exists and is affecting the overall control authority. To correct this the flight controller uses more control input to offset any loss of effectiveness, which increases the spanwise torque loads on the aircraft's wing. AAW developed from the simple observation that the aeroelasticity can be offset by the deployment of other control surfaces on the wing. In particular, almost all modern aircraft use some form of slat along the wing's leading edge to provide more lift during certain portions of flight. By deploying the slats at the same time as the ailerons, the torque can be equalled out on either side of the spars, eliminating the twisting, which improves the control authority of the ailerons. This means that less aileron input is needed to produce a given motion, which, in turn, will reduce aileron drag and its associated negative control aspects. Better yet, the wing is already designed to be extremely strong in the lift component, eliminating the torque requires lift, converting the undesired torque into an acceptable lift component. But if one can use the controls to eliminate the twisting and its negative effects on control input, the next step is to deliberately introduce a twisting component to improve the control authority. When applied correctly, the wing will twist less and in an opposite direction to a conventional wing during maneuvering. So this change, which can be accomplished in software, benefits overall performance. 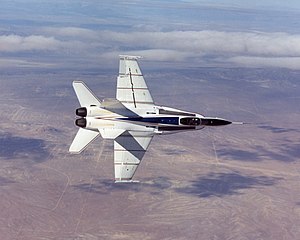 To test the AAW theory, NASA and the USAF agreed to fund development of a single demonstrator, based on the F/A-18. Work started by taking an existing F/A-18 airframe modified with a preproduction wing, and added an outboard leading edge flap drive system and an updated flight control computer. Active aeroelastic wing control laws were developed to flex the wing, and flight instrumentation was used to accurately measure the aeroelastic performance of the wing planform. Flight software was then modified for flight testing, and the aircraft first flew in modified form in November 2002. 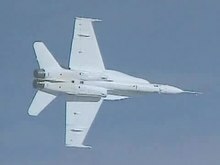 The aircraft successfully proved the viability of the concept in full scale during roll maneuver testing in 2004–2005. The test aircraft was re-designated X-53 on August 16, 2006, per memo by USAF Deputy Chief of Staff, Strategic Plans and Programs. The leading edge flap drive system was modified at McDonnell Douglas (now Boeing Phantom works) using an outboard actuation unit developed by Moog Inc. AAW flight control laws were programmed into a research flight control computer modified to include independently actuated outboard leading edge control surfaces. ^ Pendleton, E., Griffin, K., Kehoe, M., and Perry, B., "A Flight Research Program for Active Aeroelastic Wing Technology ," Paper 96-1574, Proceedings of the 37th AIAA Structures, Structural Dynamics, and Materials Conference, Salt Lake City, Utah, 15–17 April 1996. ^ "Boeing F/A-18 with Active Aeroelastic Wing Completes First Flight". Boeing. 18 November 2002. Archived from the original on 6 November 2011. Retrieved 30 June 2011. Miller, G.D., "Active Flexible Wing (AFW) Technology," Air Force Wright Aeronautical Laboratories TR-87-3096, February, 1988. Miller, G.D., "AFW Design Methodology Study", Rockwell-Aerospace Report No. NA 94-1731, December 1994. Pendleton, E., Griffin, K., Kehoe, M., and Perry, B., "A Flight Research Program for Active Aeroelastic Wing Technology ," Paper 96-1574, Proceedings of the 37th AIAA Structures, Structural Dynamics, and Materials Conference, Salt Lake City, Utah, 15–17 April 1996. Zillmer, S., "Integrated Multidisciplinary Optimization for Aeroelastic Wing Design,” Wright Laboratory TR-97-3087, August 1997. Zillmer, S., "Integrated Structure / Maneuver Design Procedure for Active Aeroelastic Wings, User’s Manual,” Wright Laboratory TR-97-3087, March 1997. Pendleton, E., Bessette, D., Field P., Miller, G., and Griffin, K., "Active Aeroelastic Wing Flight Research Program: Technical Program & Model Analytical Development ," Journal of Aircraft, Volume 37, Number 4, July–August 2000. Pendleton, E., " Active Aeroelastic Wing,” AFRL Technology Horizons, Selected Science and Technology Articles, Vol. 1, No. 2, June 2000. Edmund W. Pendleton, "How Active Aeroelastic Wings are a Return to Aviation’s Beginning and a Small Step to Future Bird-like Wings," Invited Paper, Japan Society of Aeronautical and Space Sciences Aircraft Symposium, Sendai, Japan, 11 October 2000. The Boeing Company, “The Active Aeroelastic Wing Flight Research Program (The X-53) Final Report”, Volume 1 and II, AFRL-VA-WP-TR-2005-3082, October 2005. Pendleton, E., Flick, P., Voracek, D., Reichenbach, E., Griffin, K., Paul, D.,“The X-53,A Summary of the Active Aeroelastic Wing Flight Research Program,” Paper 07-1855, Proceedings of the 48th AIAA Structures, Structural Dynamics, and Materials Conference, Honolulu, Hawaii, 23–26 April 2007. Wikimedia Commons has media related to Boeing X-53. This page was last edited on 21 November 2017, at 01:17 (UTC).